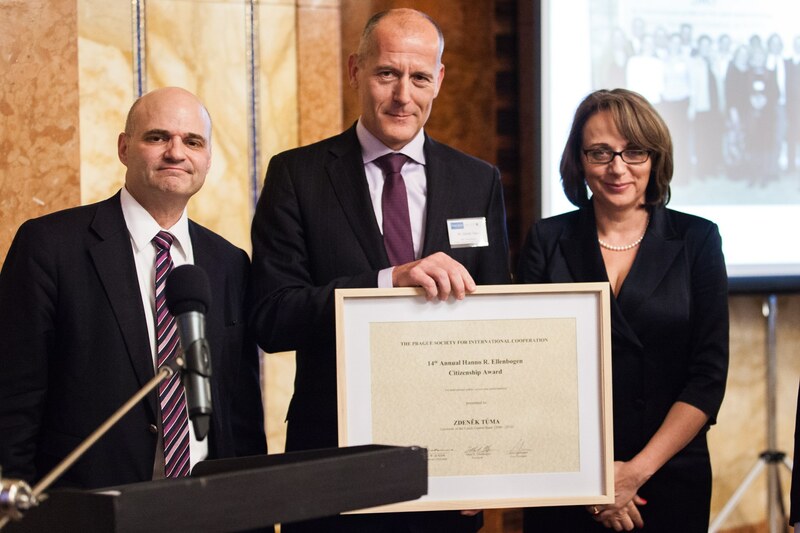 Prague, April 6 2016 – Souad Mekhennet, Tony Fitzjohn, Magda Vášáryová and Zdeněk Tuma received the 14th Hanno R. Ellenbogen Award at a ceremony hosted by Lord Mayor Adriana Krnáčova at the Mayor’s Residence on Tuesday, April 5th. Tony Fitzjohn is a renowned conservationist with activities in Kenya and Tanzania. Zdeněk Tuma former Czech Central Bank Governor and Magda Vášáryova first female Presidential Candidate in Slovakia, the ambassador of Czechoslovakia in Austria (1990–1993) and ambassador of Slovakia in Poland (2000–2005) and Czech and Slovak Screen Doyenne. Previous recipients include the Dalai Lama, Václav Havel, Miloš Forman, Wesley Clark and Věra Časlavská. 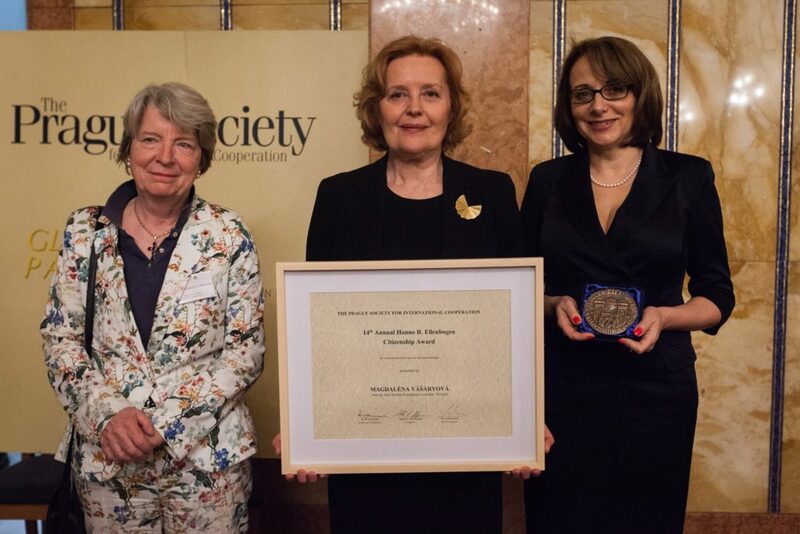 The Award is ranked by UN as one of top five Awards in Central and Eastern Europe and is jointly presented by the Prague Society and the Global Panel Foundation. “This Award is about courage – the courage to change, to stand against mediocrity – to think beyond parameters. 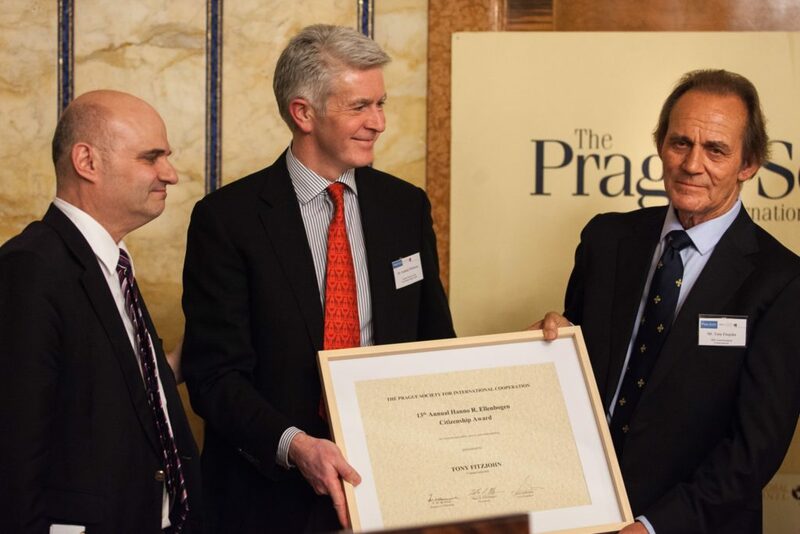 Each of these recipients has shown that courage” said Marc S. Ellenbogen, the President of the Prague Society and Chairman of the Global Panel Foundation. The annual HRE Citizenship Award honors life-long dedication to public service. The award comes with a 40,000 CZK cash prize. It is typically donated to a young person of the recipient’s choice. Souad Mekhennet nominated organizations Praunheimer Werkstätten and Die Weisser Ring, Tony Fitzjohn nominated Arthur F. Sniegon which is an aspiring conservationist from Czech Republic. Magda Vášáryova has chosen the oldest women organization in Europe – Živena and its activity towards females from the Roma community in Slovakia and Zdeněk Tuma has chosen Petr Koukal, Czech Olympic winner and his foundation which is helping men with testicle cancer.